New Delhi: DLF Ltd, India’s largest listed real estate developer, plans to build and run its own metro rail to provide mass transport to its townships after talks failed on building such a system jointly with the government-linked rail transporter in the New Delhi region. The developer is now in discussions with global railway equipment vendors to source automatic metro rail systems, which it claims will be more sophisticated than the current system being used by the Delhi Metro Rail Corp. or DMRC. 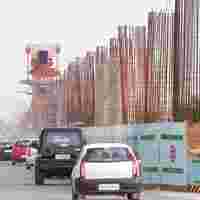 DLF, which made its name and wealth building Gurgaon, a southern suburb of Delhi, wants to create its own metro systems to ensure easy connectivity for people who live in its townships on the outskirts of metro cities. Leading railway equipment makers and rail automation solution firms such as the Bombardier Group, Siemens Ltd and Rotem Co., a subsidiary of Hyundai Motor Group, have held talks with DLF. The Delhi-based developer is looking at partnering with two companies, said A.S. Minocha, chairman, DLF Commercial Developers Ltd.
“We will need to tie up with an equipment manufacturer and a rail automation-solution company. So it could be an agreement between DLF and two more companies," Minocha said. A deal could be closed in the next four to six months, he added. An official of the urban development ministry said private rail networks are allowed under existing laws, but the firm will have to get mandated permissions from various state and Central authorities. Some international firms confirmed they were in negotiations with DLF. “We have had a brief talk with DLF," a Bombardier official said. “But the talks are still at a preliminary stage." “We are in talks with all the potential customers for our products and solutions but it’s too early to divulge any more information," said Vilas Parulekar, director, Siemens. Its parent, Munich-based Siemens AG, provides transportation solutions ranging from signalling and control to railway electrification. DLF was previously in talks with DMRC to build private metro rail projects for its townships. But now it has decided to go on its own. “The pace (of metro rail development) in Gurgaon is much slower than what it should be," Rajiv Singh, vice-chairman, DLF Ltd, had said in an interview to Mint on 24 August. “We don’t see ourselves as an infrastructure developer. But the customer has suffered, so we want to provide the metro right at their doorsteps." According to C.B.K. Rao, who was previously the project director of the government-linked transporter, and is now advisor to DLF Commercial Developers, the company requires the sanction of the Haryana government. “We need the sanction of the state government as we require some government land for the project and they would be supplying electricity for the metro project," he said. The company has written to the Haryana government for sanction to build private metro projects. Haryana Urban Development Authority officials couldn’t be reached for comment. DLF plans a metro line from Sikanderpur Chowk station, the last station on the proposed government managed Delhi-Gurgaon metro line, to DLF’s Mall of India project on National Highway 8, along the Delhi-Gurgaon border. A month ago, DLF had contracted RITES Ltd, the survey arm of the Indian Railways, to examine the possibility of extending the Delhi-Gurgaon metro line being built by DMRC to its tech township, called DLF Cyber City. While the model for the metro has not been decided yet, DLF is likely to opt for an elevated metro model. “We are not going for a conventional metro system. An underground metro rail project will cost three times higher than an elevated one," Rao said. The total height of the metro will not be beyond 7m. The estimated construction cost of an elevated metro line is around Rs95-100 crore per km. DLF’s metro system will be less noisy, Rao claimed. “We will not be having any drivers for our metro rail," Rao said. “It will be completely automatic." DLF is seeking tax and other exemptions from the Haryana government. “We have requested the government to provide us electricity free of cost," Rao said. It wasn’t immediately clear whether the government would give such incentives. Advertisements at kiosks in stations and within the metro rail will add to ticket revenues. DLF is also looking at developing private metro projects for its townships in Mumbai, Hyderabad and Bangalore.